Hi, Welcome to my Blog. My name is Sudharsan RaviKumar. 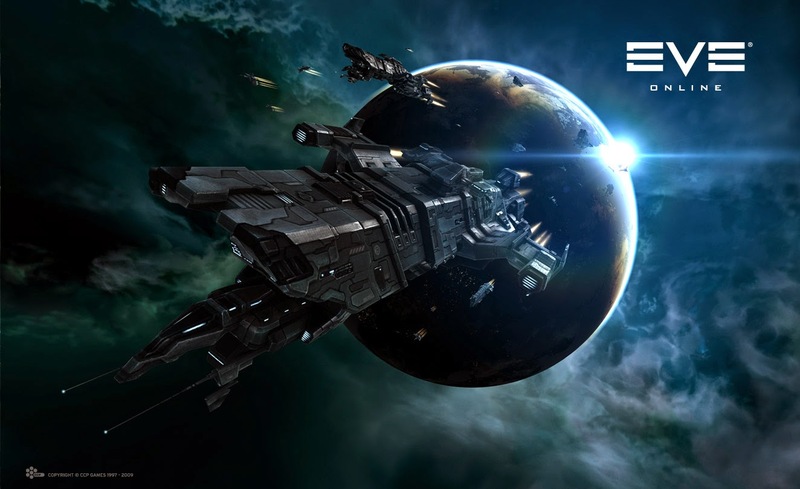 I'm going start off with this blog by reviewing and at the same time covering important aspects of one of my all time favorite MMO named EVE ONLINE by CCP game studios. This is not a biased review, just a common viewpoint preview from a casual gamer. The motive of this Blog is to make new people try the game and also understand about the various things you can do in the game. The goal of this blog is to help new people try the game. I hope you enjoy my preview. Have you ever played a game that gave you a certain scintillating experience? Like everything you see on the screen is awesome and will be brilliant? The answer is “Yes” for me as I’ve played two games like that. One is Fallout 3 (SOLO RPG game for pc and consoles developed by Bethesda game studios) and the other is EVE ONLINE. Fallout 3 is my all time favorite solo RPG because of its flabbergasting post-apocalyptic atmosphere and various solo RPG elements. Similarly, EVE ONLINE is a massive multiplayer online role playing game developed by CCP games in 2003, where everything happens in an open and persistent Universe. There are plenty of activities in the game which players can engage themselves into and find it very rewarding. The bright universe and its subordinate contents totally take your breath away, keeping you allured to the game for longer periods of time in your life. There are more than 5,000 solar systems connected to each other in the form of star gates, which the player is free to explore. To travel around these systems, the player must use the “Star gates”. The systems are classified into High security space, Low sec and Null sec space. There are certain limitations in each of these levels of space. Certain systems can contain a single or multiple stations where players can dock up with their ship and use services.Stations already exist in NPC systems, but can also be built by players themselves in sovereign space. We will talk more about that later. The game offers you lofty amount of ships to fly. Each ship from different race serves an exemplary purpose. For instance, there are ships used to commence combat , ships to carry goods around different solar systems (They are referred to as Industrials), ships to observe your target in an invisible manner (covert- ops), ships to mine asteroid belts and finally capital ships that are used for combat, Freighting and support. To be more precise, the level of ships starts from Rookie ships, frigates, Destroyers, Cruisers, Battle Cruisers, Battleships, Carriers, Dreadnoughts,Super carriers and finally the Titan ship. There are also ships for industrial purposes like Industrials, mining frigate,mining barges, Exhumers, Industrial command ships, Freighters and Capital industrial ship. As told already, Each level of these ships serves a particular purpose in the game. As you start flying higher levels of ships, you will experience a decrease in agility and maneuvering but that would be compensated by their abilities. Ships are built from minerals that are extracted from the ores mined by mining ships in asteroid belts. Players can sell the ores/minerals to make ISK or simply build their own ships. We can buy modules from the market that are constructed from moon mining minerals and other stuff which can be fitted to these ships. A ship has high slots, medium slots, low slots and then rig slots. Different types of modules can be fitted onto these slots. The market in the game is player controlled. This means that prices for buying and selling of ships, modules and other items are on the hands of the players. Remember, Each and every station has a market and items can be sold and bought in any of the stations. There are 5 major systems in the game with stations that serves as common trade hub. A system named “Jita” being the most important trade hub. . A piece of advice for newbies “Don’t get scammed. If you see something for cheap or a deal (a contract) in a trade hub system that seems profitable, then it’s definitely a scam”. Do not come up with the wrong assumption that as a new player you can get your hands into all of these ships. I’m sorry but yes, your ability to fly ships of different type from each race depends on your fulfillment of the required skills to pilot it. If you do not have the required skills for a ship, Then you cannot fly that. For instance to fly an amarr cruiser, you would require amarr Frigate skill to level 3, and amarr destroyer skill to level 3 and then amarr cruiser to level 1. Skill books can be purchased off from the market from NPC’s and then injected onto the player to commence training. Skill points are the most important aspect of the game. The new player starts off with 5000 skill points. Skills take a set amount of time to train to each level. There are 5 levels in a skill where each level offers a bonus to a common parameter that affects a trait. However, there are implants available in the market that the player can "plug in" to reduce the training time of skills. 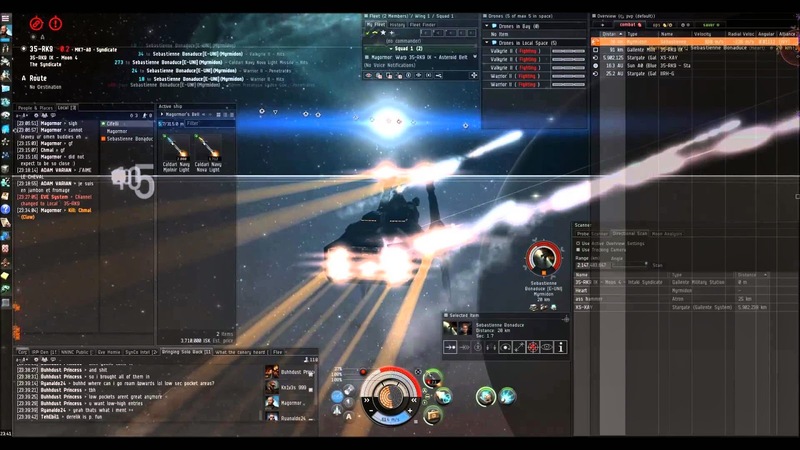 EVE ONLINE is all about having skills and an old player can fly ships that he had already trained for. I regret to say this, if you’re a new player then you will limited to what you can do in the universe. As you commence on training more skills further, the limitation decreases. Certain skills takes weeks or even months to train. The new player must be focused on the list of ships he prefers to train for within due amount of time. So patience is the key to success in EVE. Those who wait shall earn the right bread. ‘ISK’ short form of Interstellar Credits is the in game currency in EVE. With ISK you can buy ships ,modules, and other commodities or services in the game. There are different ways to make ISK from the game depending on how far you are prepared to take risk. The game strictly adheres to the rule, RISK=REWARD. New players can make considerable amount of ISK in high sec systems. They can visit or live in low/Null space to make a lot of money which comes with a risk from other player trying to disrupt what you’re doing by attacking your ship. But, other players cannot attack your ship in high space as it is protected by a set of NPC’s named CONCORD. Any players aggressing others in highsec will be immediately terminated by CONCORD Force. There are different set of activities to make ISK. With the common PVE aspects of the game, a player can run missions, mine, haul goods, manipulate the market,run incursions, explore signatures in space, moon mine , indulge in planetary interaction and run DED sites to make isk. The profitability of these activities depends on the system security level. Even one can profit from PVP , that is by looting your opponents wreck and salvaging it to recover modules that survived during the destruction of that vessel. The player gets lucky if any expensive module that is fitted drops. PVP is the heart of EVE. PVP can be 1 vs 1 (or) 1 VS many (or) Many VS Many depending upon the size of the corporations/Alliance involved in the battles. A player can join a corporation and the key to win most PVP battles is effective communication between your friends and reliable intel about the surrounding space. With the right amount of ships and effective modules fitted on those ships, a group can win a PVP battle efficiently. It all breaks down from the experience. One cannot always indulge in PVE activities and restrain from PVPing as it will take away the original feel of the game and sadly it starts wearing away. Large alliances consist of a lot of corporations within them. These corporations work as allies and engage their members into common activities towards PVP and PVE. 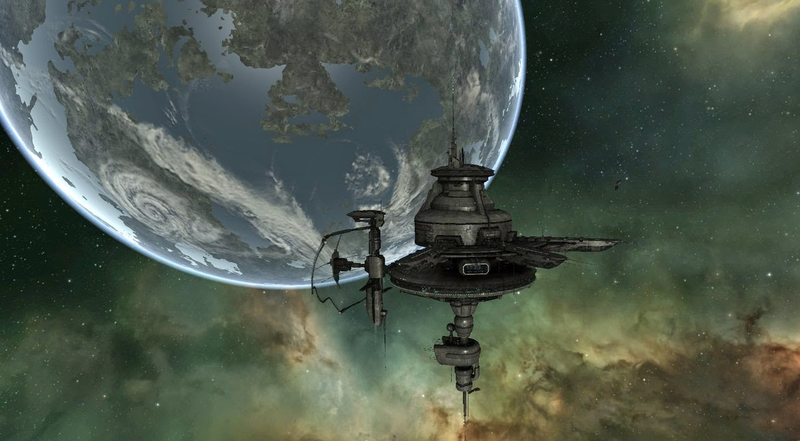 In EVE, there are several systems without stations that can be claimed as sovereign space by players. These alliances can construct stations and claim ownership of that system. Though building a station can be costly and painful, as it takes more than 24 hours to erect them and put it online for use, it can be worth it for the sense of a home and point of commerce. The rest of the systems are controlled by racial NPCs. This is just an example of how one of the many different stations looks. Wormholes are a totally new world within EVE. In wormholes, players can find a common NPC named sleepers. A wormhole’s security status is similar to null sec. Wormhole are dynamic space which means that the exit of WH changes everytime from 24-30 hrs.That is, a wormhole can be spawned in a normal solar system for a temporary period of time (24-30hrs) and players are free to scan down the wormhole and access it. Wormholes may spawn in any level of solar system and also in other wormholes too. So, a player must be very careful in a wormhole as the Ddetails about players in the Local is not visible. A player must chat in local initially to reveal that he is existing in the space. Often, wormhole entrances and exits are camped by players to kill passing vessels. Wormholes are classified from class 1 to class 6. Where each class inflicts some limitations and determines the difficulty amount of sleeper sites from where valuable items can be recovered from the sleeper wreck. Even certain wormholes have major effects that affect the attributes of the ship. A player or a corporation can live in a Wormhole by anchoring a POS (Player owned structure) as there are no stations in a Wormhole and they cannot be constructed as sovereignty cannot be claimed in wormhole space. Players can colonize on planets to recover minerals that can be sold in market to make ISK or use them as a fuel for their POS. This feature is called Planetary Interaction. It can be done in other levels of space too. A deviation from the characteristic of a normal Wormhole is the new “thera” space that is introduced by CCP in the 2015 patch. In thera space, players can find stations constructed by NPCs to dock at and a lot of signatures to scan down comprising lot of exits/entrances. Certain battles can be costly in eve as they can be equated to Real life currency. This is possible with the introduction of an item called as “PLEX”. A Plex can be used to add 30 days game time to an account or activate multiple character training (An account can have 3 characters in it) or to resculpt your character’s appearance or It can be simply sold in the market to make ISK. CCP prices a plex for 20$ currently and the present value of a plex is around 800 millions. There are battles in eve that results in a great loss of ISK. However instead of buying a plex for $ or ISK, players can choose to subscribe to EVE ONLINE for a specific period of time from EVE online website. There are particular losses in the game that affect people more emotionally and makes them to RAGE QUIT!. Yes, for instance a Titan costs around 100-110 billion ISK. A player owning a titan without any insurance from his corp/alliance becomes vulnerable to fact that recovering himself from the loss of the titan can be very tedious. Getting ganked constantly by pirates also contribute to that fact. But one can avoid that by flying carefully and proper fitted in dangerous parts of the space. Also a corporation is vulnerable to thefts and heists if they entrust important responsibilities and assign roles to a notorious pilot. As, the pilot has access to an expensive content worth stealing. So corporations can avoid these anomalies by giving roles to the right person. The game is very consistent and constantly updated by CCP during every patches. The game manages to adhere to the present generation graphics. As mentioned already, it is improved upon every patch. This keeps all the players very much engaged with the game and still manages to attract new players. The game is completely coded in brilliant python/MySQL and C++ is used in some parts. I do not prefer to give a rating for the game. I hope you enjoy your first experience. Thanks for reading my preview. Click on the below link for free 21 day trial, if you wish to try eve.